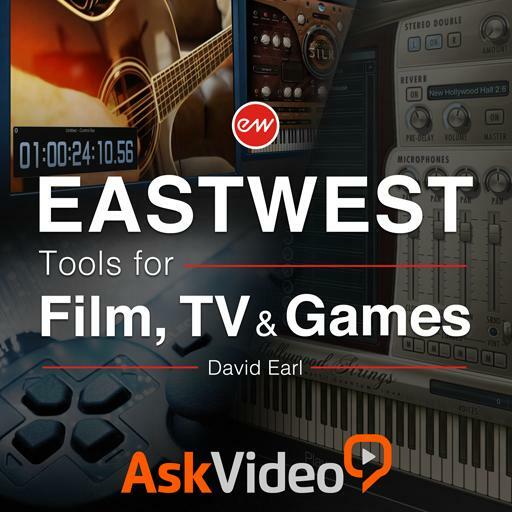 EastWest 103 - EastWest 103: Tools for Film, TV & Games. What is the difference between a slur and portamento? What controller should you always try with East West libraries? What are the different mic positions in the EWQLSO? What are the 3 languages of WordBuilder? How many mic positions were used to create the Stormdrum 3 library? How do the timpani libraries make rolls easier? What does ‘SUS 6’ mean in a string ensemble? Which controllers does the EWHS like to see the most? Why would you create a separate lane for key switches? To make exporting MIDI files without the keyswitch notes for a scoring program easier. In Stormdrum 3, how do you turn on the SSL channel strip? Why would you use a script sim? The script sim is used to keep track of the articulation setting and can be used as a controller map as well. If you are using an instrument that does not have a script built in, like Round Robin samples, these scripts provide a facsimile by using different tuning, timing, and sample selection techniques. The script sim can only be used with libraries that are programmed to take advantage of the sims. The script sim is used to get more dynamic layers out of an instrument where they previously did not exist. What kind of palette is the Dark Side working with? How are MIDI performances used with the SD2 library? WordBuilder allows the composer to create phrases for the symphonic choir to sing. Wordbuilder uses spectral synthesis to playback speech patterns. Wordbuilder uses a combination of physical modeling and granular synthesis to generate speech. Wordbuilder is a synthesizer built on formant synthesis. In Hollywood Strings, what does NV NV VB MV mean? What was the name of the producer that Doug Rogers and Nick Phoenix teamed up with on the Hollywood Strings library? What are the main singers of Symphonic Choir? What purpose do the Goliath instruments primarily serve? Why does the Powerful System have its own folder? How do accents work in the Hollywood Strings library? What category is the Harp under? What is the advantage of using the FX version of the Dark Side instruments? In Stormdrum 3, what is the difference between Tune ‘A’ and ‘B’?